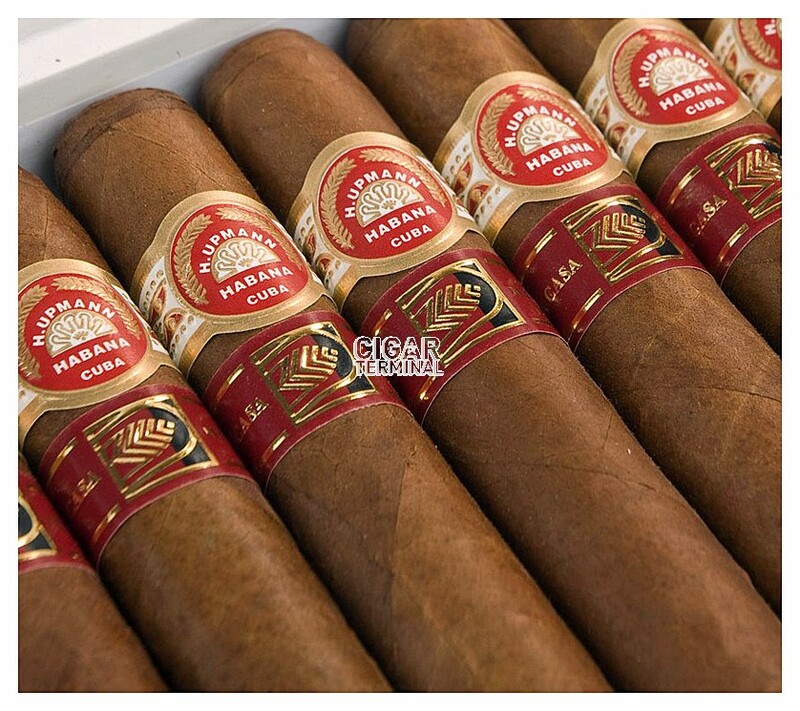 The H.Upmann Royal Robustos is a medium Edmundo, a La Casa Del Habano exclusivity, 5.3” (135mm) long, of 52 ring gauge, and comes in a 10 cigars box. Released in limited quantities in 2011, in front of its great success, the production of this little jewel continued since 2012. This is cigar is hand-rolled by La Casa Del Habanos for H Upmann, and is using only long filler and tobacco leaves from the Vuelta Abajo zone in the Pinar del Rio region in Cuba. The cigar has a beautiful construction, smokes very well. Not a very strong cigar, nor very complex, it is medium bodied, and offers great Cuban flavors: coffee, earth, hay and lots of cedar. This cigar is also quite spicy, which makes it a great everyday cigar. It also has a great potential for aging, 2 or 3 years are recommended. The H.Upmann Royal Robustos is a very good everyday cigar. 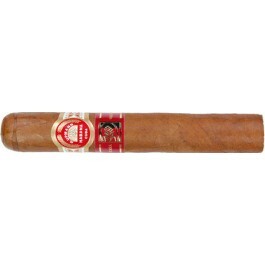 • Not very strong cigar, but typical Cuban flavors: earth, hay, coffee, cedar, chocolate, and spices. • Ages very well. 2 or 3 years on, the cigar becomes even more complex and creamier. This cigar is simple and spot-on. A great stogie. 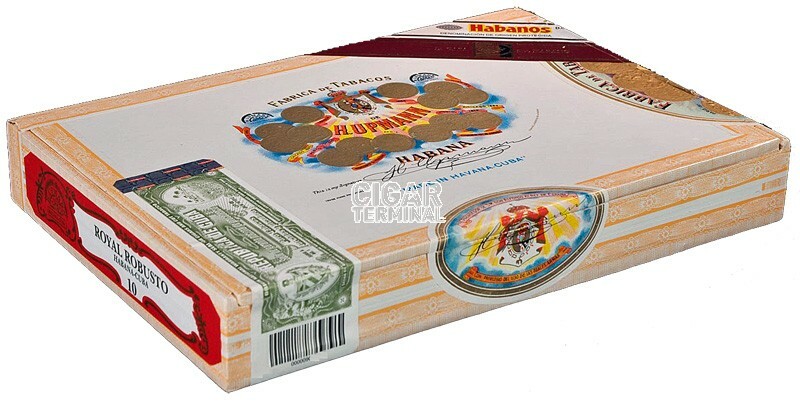 H.Upmann Royal Robustos - 10 Cigars comes in a dress box with Habanos Packing Code CB-UW-n-10-n-10. The cigar is looking fantastic, with a perfect construction. The wrapper has a very dark chocolate brown color, and has a nice oily sheen. Only few veins are visible, nothing major. It is firm to the touch, only has a bit of give when squeezed. In addition to the H Upmann band, there is a second band carrying the La Casa Del Habano logo. The wrapper smells of hay, barnyard, wood and cacao. The cigar cuts easily, the cold draw is perfect with just enough resistance and gives aromas of coffee and leaves some salty spice hints on the lips. Once lit the ashes burns slowly and holds well for about half an inch. The burn line isn’t perfect, slightly wavy, but the draw is perfect all through the cigar. The ash is quite flaky with a nice dark grey color. This cigar generates tons of smoke. From the get go, the cigar greets you some woodsy flavors, joined with a spicy tang of green bell pepper on the lips and on the nose. The first puff reveals a medium to full body cigar, which is rich but not creamy. The first third is typical H Upmann, with lots of nuts (peanuts, almonds), cedar, hay, earth, dark chocolate and coffee. There are still some of spices, white and green pepper and just a bit of sweet notes of sugarcane, shortbread and vanilla. Few hints of lime and dry tobacco are also present. Overall, the first third is of medium strength, and slightly creamy at times. In the middle third, the flavor profile is similar to the first one, with now more sweetness, of burnt caramel or honey. The chocolate taste is coming to the forefront, next to strong grassy hay notes. There are also notes of tea, and cinnamon and still this green pepper. The strength increased somewhat, whereas still in the medium bodied category. In the final third, the dominant flavors remain similar to the previous third, still lots of chocolate, coffee, hay, earth, tea and pepper. There is still sweetness from honey and caramel/toffee. Overall, it is a rather creamier third, but the strength increased once again, now a strong medium. In summary, it is great cigar, lots of complexity and a unique personality.